Many divorcing couples spend too long in emotional limbo. When things are unresolved, it can be hard to move forward with your life. I’ll show you how to divorce jointly online in a way that is simple, respectful and mutual. 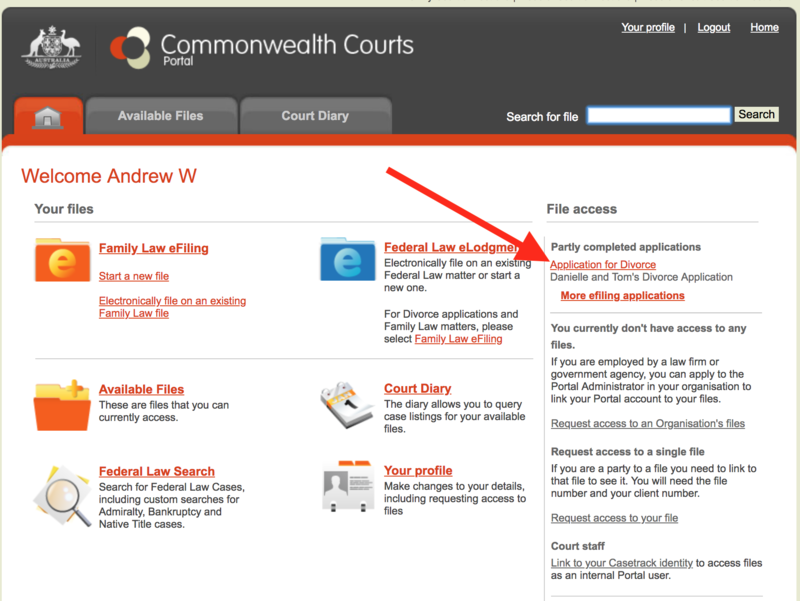 You can do this yourself right now using the Commonwealth Courts Portal. Being able to finalise things after a relationship breakdown is important to moving forward. The average couple in Australia takes 3.6 years between separation and divorce (according to the ABS). It takes some time after a separation to come to terms with the change. It’s also for good reason that you’re required to have been separated for at least 12 months before applying for divorce. If you’re not completely certain that the relationship is over, this article isn’t for you. 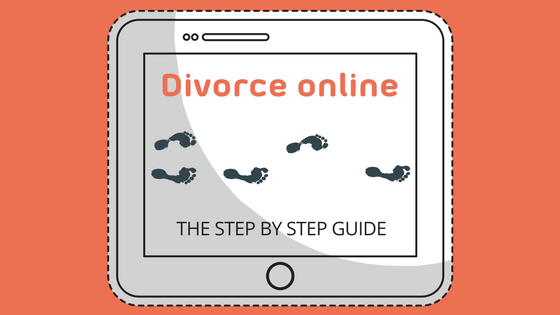 However, if your relationship is over and you’re living in limbo simply because it seems too hard to deal with, this article will walk you through the online divorce process step by step. I’ll explain everything you need to know with simple instructions and plenty of screenshots. This is something you can do right now, so follow along with each step. This article is intended for amicable couples who are applying for divorce jointly. If you need to apply for divorce on your own (known as a sole applicant), this will still get you most of the way, but there are a few extra steps you’ll need to do around serving your ex. You’re probably aware of the Hollywood cliche of someone trying to serve divorce papers on some poor ex who can’t let go; the professional process server staking them out so they can pounce on them the moment they let their guard down. The reality in Australia in 2018 is that more and more couples are now choosing to apply for divorce jointly. In 2010 joint applicants outnumbered sole applicants for the first time in history, so you’re in good company. Most people getting divorced don’t know this. It’s important because you’ve only got 12 months to finalise a financial settlement once you’ve divorced. If you’ve got super, property or any other amount of assets, you’ll probably want to sort out a financial settlement before you get divorced. You can finalise your finances at any time from the moment you’re separated. If this is something you need to do, stop reading this article and head over to Divorce in Australia: Who gets what? The adieu process is a low-confrontation option for couples who want to legally finalise their property in a way that’s fair to both. When are you allowed to divorce? 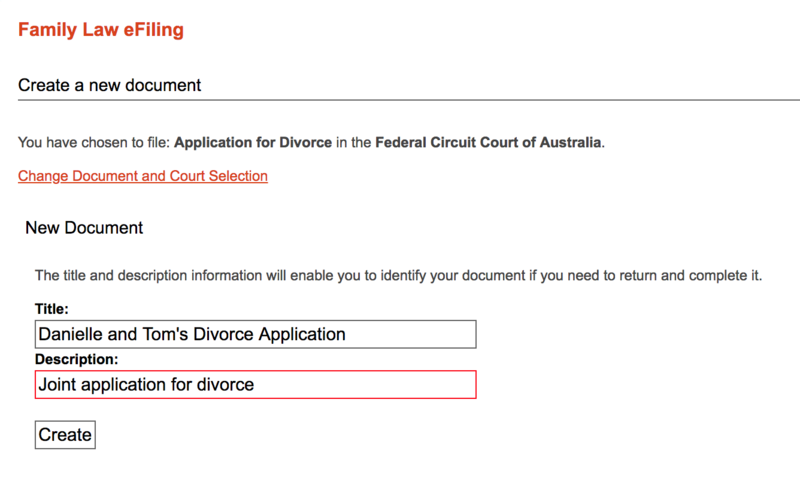 The requirements for divorce in Australia are really simple. We have a no-fault divorce system, which means that no one needs to have done anything wrong for you to apply for divorce. If your marriage has broken down and there is no reasonable likelihood that you will get back together, you can get divorced. You will also need to have been separated for at least 12 months (separated under one roof counts) and have your marriage certificate to hand. You could sit down together and fill out the information. One of you could fill out all the information and just have the other check it. One of you could fill out most of the information and have the other fill out the questions relating directly to them. 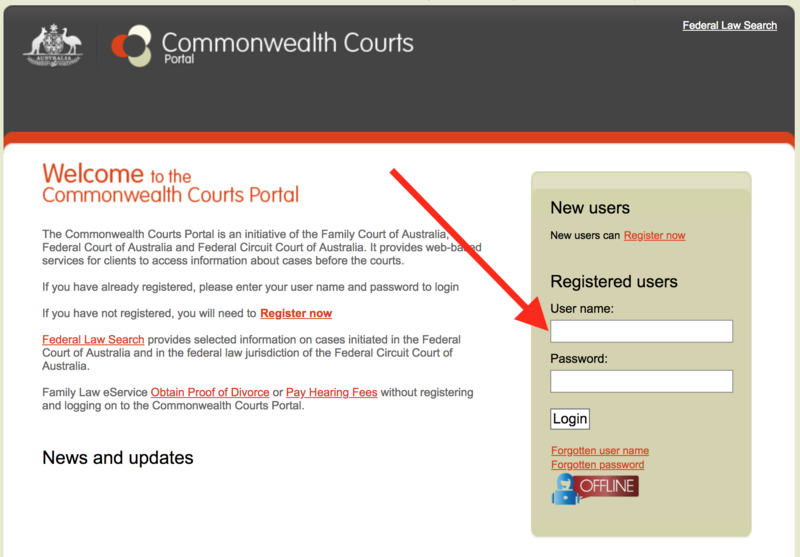 To register, go to https://www.comcourts.gov.au and click the ‘Register now’ link. 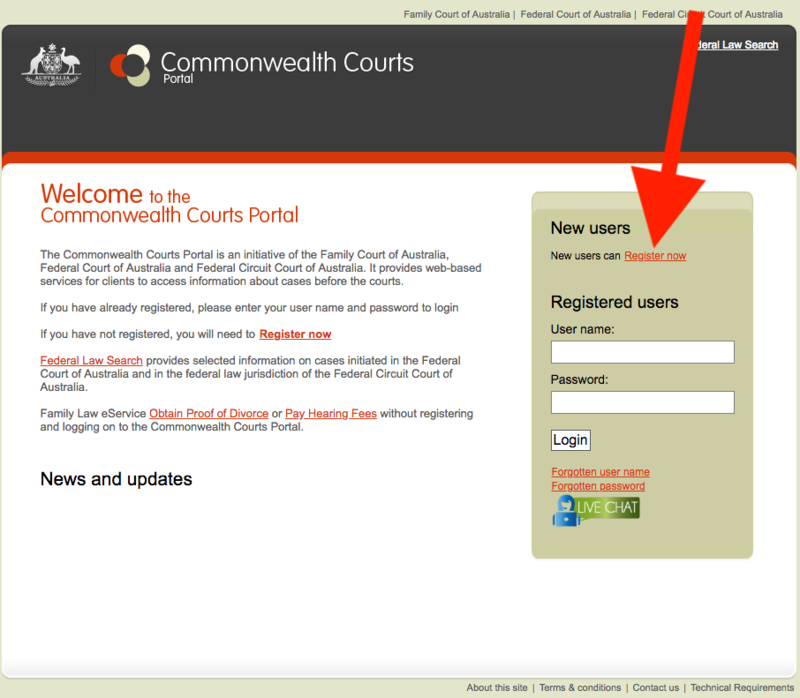 Fill out your details to create an account and you’ll then see the homepage of the portal. 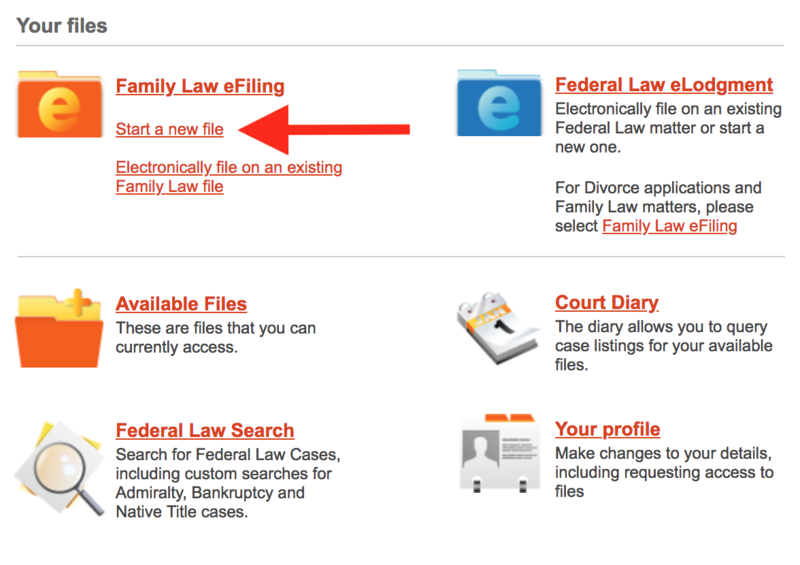 You can start your divorce application by clicking ‘Start a new file’. Confirm that you’re filing on your own behalf. 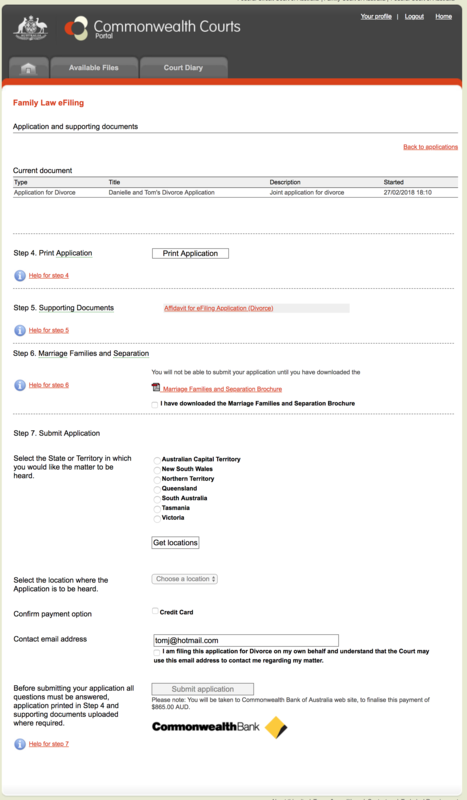 Select ‘Application for divorce’ in the ‘Federal Circuit Court of Australia’ and continue. The Federal Circuit Court deals with simpler family law and child support cases in order to free the Family Court up for more complex cases. You’ll need to choose a name and description for your application. You can make these whatever you like, just choose something that makes sense to you. Get started by clicking ‘Part A: The applicants’. 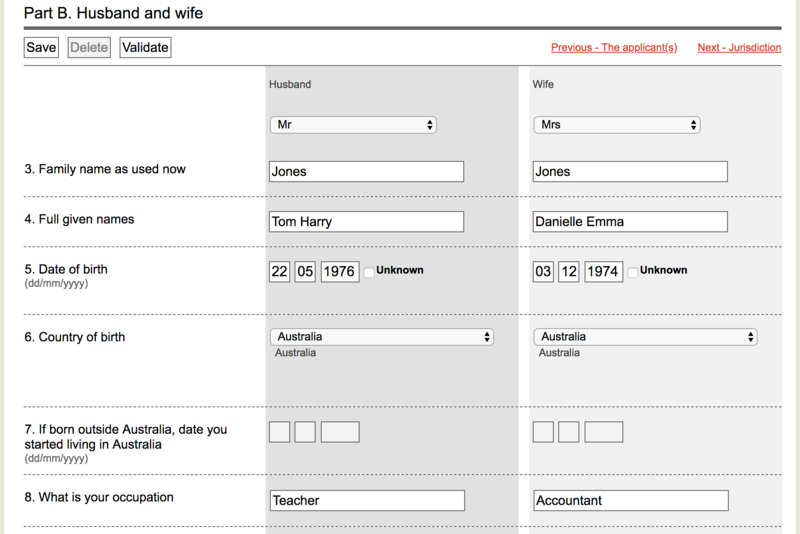 If you’re applying jointly, select Husband & Wife together. Then identify which of the two you are. If you’re sitting together doing the application, just select whichever of you has actually registered for the portal. Choose whether you’ll be applying for a reduction of the filing fee. The standard fee for a divorce application is $900, which you’ll need to pay by credit card at the end of the process. If you qualify for a fee reduction, you’ll only pay $300. To get this reduction however, you’ll both need to qualify for it and will need to provide evidence (such as a health care card). Take a look at the guidelines for qualifying for a reduced fee if you think you might be eligible. Next, we’ll select not to attend the hearing. Joint applicants don’t have to attend the hearing regardless of whether they have children. So there is no need for you to go to court or do anything other than complete this online application. That’s Part A done. We’ll be saving our application as we go, so we can come back to it at any time. Let’s do this right now by clicking the ‘Save’ button. This will also validate the current page – which just means it makes sure that you haven’t missed anything. Whenever you press the save button, you’ll get a little popup asking you whether you’re sure. Just hit ‘OK’ for this. You’ll also see a ‘Validate’ button near the ‘Save’ button. Each time we save, it automatically validates, so you can ignore this button altogether. We’re now ready to move to the next part of the application. Let’s do that by clicking ‘Next- Husband and wife’. Before we get into the next part, let’s quickly cover how to get back into the application at a later time. You may need to do this if you are missing some information, need to have your ex-partner fill some of it out, don’t have documents ready to upload or simply don’t have time to do it all in one sitting. To get back to where you were, go to https://www.comcourts.gov.au. This time however, instead of clicking the register link, use the username and password that you set when you registered. Click the login button. This will take you back to your portal homepage. You’ll see your application on the top right with the name and description you gave it when you first created it. Click it to continue. If you need to ask a question or get help while you are completing the application, you can use the live chat. They only seem to be available in businesses hours but are eager to help and respond fairly quickly. You’ll find the live chat link on the login and homepage screens at the bottom right. When you’re actually in your application (where you’re most likely to need it!) you won’t see it anywhere. You can still access it however by clicking the tiny ‘Contact us’ link right at the bottom of the screen. You can also email them at support@comcourts.gov.au or call on 1300 352 000. Now that you’re comfortable saving your application, getting back into it and getting help if you need it, let’s start the next section. Fill in the personal details for each of you. As mentioned earlier, you can each fill out your own information, or alternatively one of you could do it first and just have the other check it later. Your address for service is the address that you’re asking the court to send all of its correspondence with you to. This must be an address in Australia. 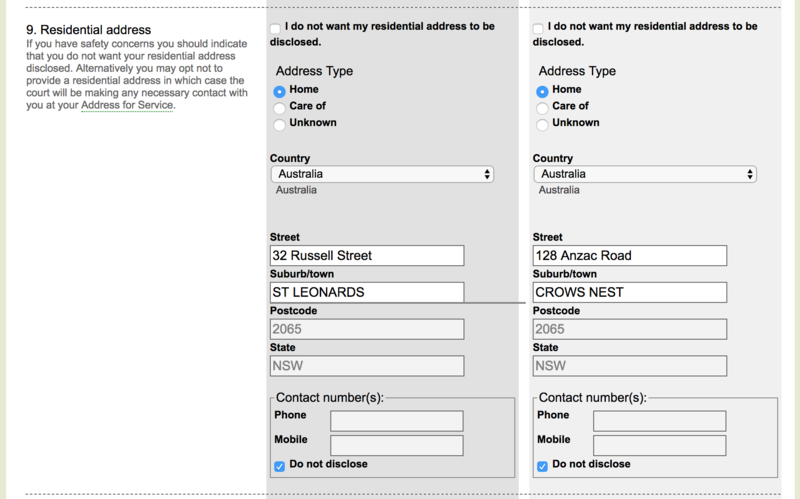 If it is simply your residential address, you can just select that option and don’t need to type it all in again. Save the information in the same way that you did for Part A and then move to the next section by clicking ‘Next – Jurisdiction’. 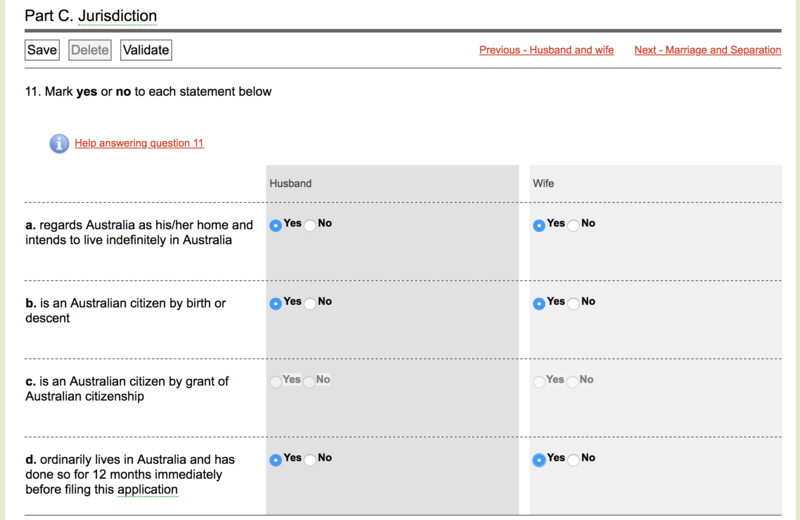 To ensure that you’re actually able to apply for divorce in Australia, one of you will need to be able to answer ‘Yes’ to at least one of these four questions. Save again and move to the next section. This section is all about the details of your marriage and then your separation. 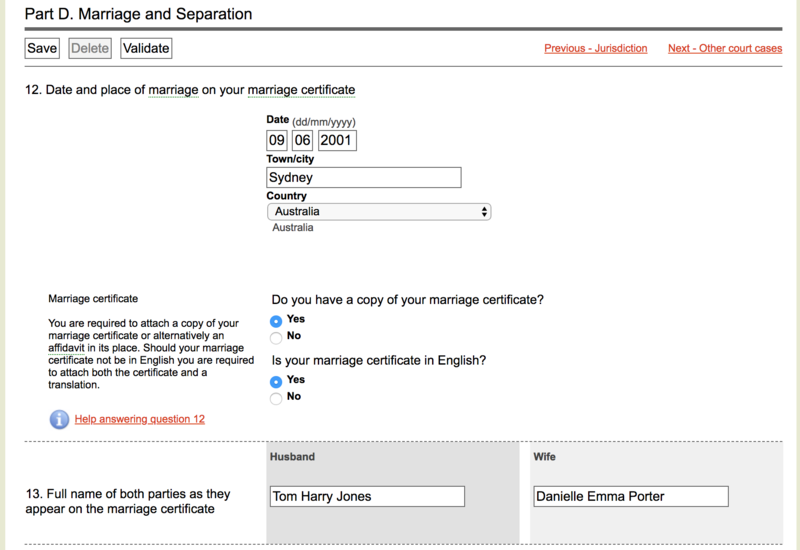 You’ll need to provide a PDF of your marriage certificate, so will need to get a copy if you don’t have it to hand. If you don’t have the certificate, don’t worry about this right now as you’ll still be able to complete the application. You can then get a copy from the Registry of Births, Deaths and Marriages in the capital city of the state in which you were married. The questions around your separation are really about making sure that you’ve met the minimum 12 month separation period required before being allowed to apply for divorce. The breakdown of a relationship is often experienced differently by each partner and its details and dates are not always clear-cut. Start with the details of your marriage. The date of separation is the date that you considered the relationship to be over and had some kind of communication between you about it. One of you doesn’t necessarily need to have moved out as it is possible to be separated under one roof. As you need to have been separated for over 12 months to apply for divorce, this date will of course need to be more than 12 months ago. At least one of you will need to have regarded the marriage as over at the date of separation. If one of you disagrees about this, you can provide your own date for when you regarded the marriage as being over. If you were separated under one roof, you’ll need to specify when. If some of the required 12 months of separation happened under one roof, you’ll need to each provide an affidavit demonstrating that there was a change in the relationship. Again, you don’t need to worry about this right now and will be asked to upload this after you’ve finished the application. You can read more about being separated under one roof on the Court’s website. The next question is again about ensuring that you’ve been separated for at least 12 months. If you separated and then got back together for a period of time before separating again, you can add both separation periods together to reach the required 12 months. However, if you got back together for more than 3 months or multiple times, the 12 month clock starts again. To be granted a divorce, your answer to the question ‘Do you think it is likely that you and your spouse will live together again as husband and wife?’ must be ‘No’. In Australia, you can only divorce if your marriage has broken down and there is no reasonable likelihood that you will get back together. The final question checks whether you’ve been married for more than 2 years. You can still apply for divorce if you’ve been married for less than 2 years, but you’ll need to attend counselling and get a counselling certificate confirming that you’ve discussed the possibility of reconciliation. Without this, you’ll need special permission from the court to apply for divorce. You’re now done with this section and are ready to save and move onto Part E: Other court cases. Pending cases is where is where you let the court know of anything else that is going on. If you’re an amicable couple who is divorcing jointly, you’ll probably not have any other court cases happening. If you’re doing a financial settlement, you’ll likely have had the orders made before you apply for divorce. 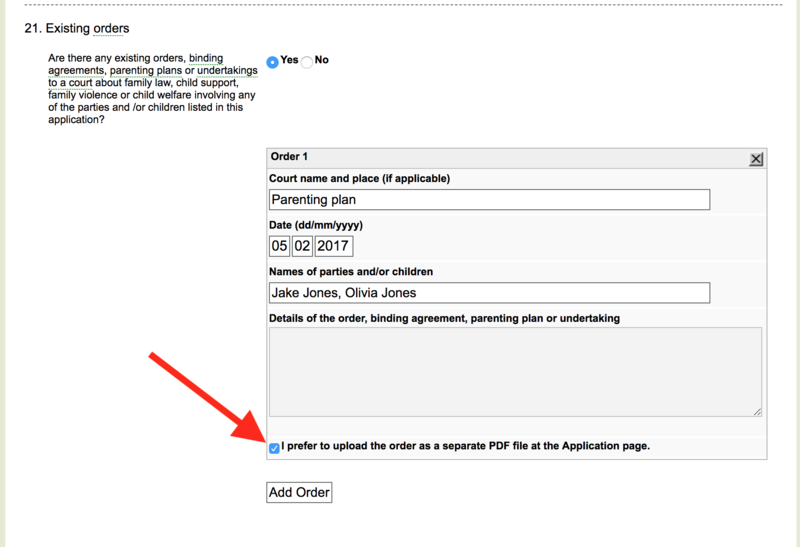 If you’ve got a parenting plan or financial orders in place, you’ll need to include those in the existing orders section. If so, you’ll probably find it easier to attach them as a PDF rather than try to include all the details in the little box that is provided here. If so, just click the checkbox saying that you prefer to upload the order as a separate PDF at the application page. If you’ve got more than one, just use the ‘Add order’ button to create another box for each. If you end up with one box too many, you might find the system complaining and asking you to fill it out when you try to save. If you’ve added one by accident, just use the cross at the top right to remove it before pressing the save button. You’re now done with Part E and are ready to save and move on to Part F which covers children. If you’ve got children under 18, the court needs to know that proper arrangements have been made for their care before they will grant a divorce. Here you’ll need to make it clear that the children’s financial, health and education needs are being met. You’ll also need to demonstrate that they have a meaningful relationship with the other parent (or explain why they don’t). If you have children who are treated as part of your family like a step-child or foster child for instance, you’ll need to include them here as well. You need to provide information for each child, even if their care arrangements are the same. 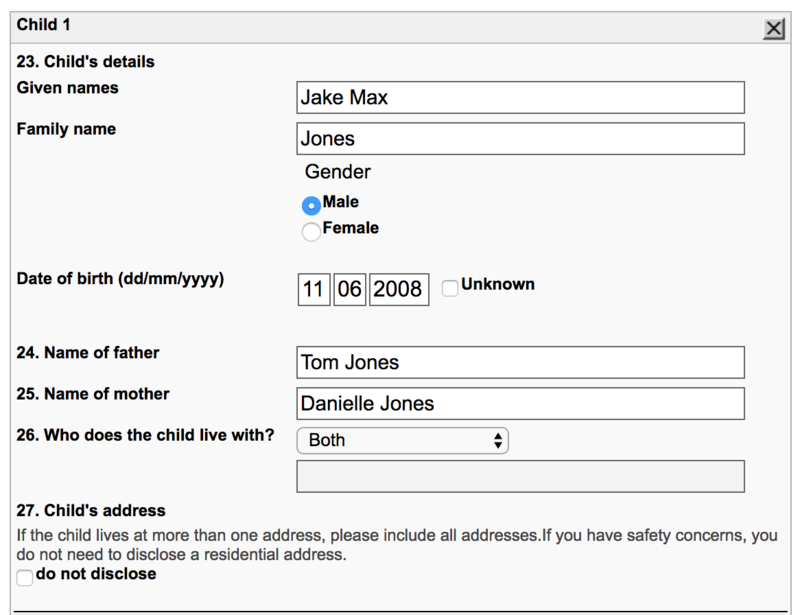 Click the ‘Add Child’s Details’ button for each child to create an information box for them. The address is for where the child lives most of the time. If the time is equal or similar between the two houses, put both addresses in. There isn’t really a strict definition of “Most of the time”, so feel free to put in both addresses if you’re unsure. To add a second address, just click the ‘Add address’ button. 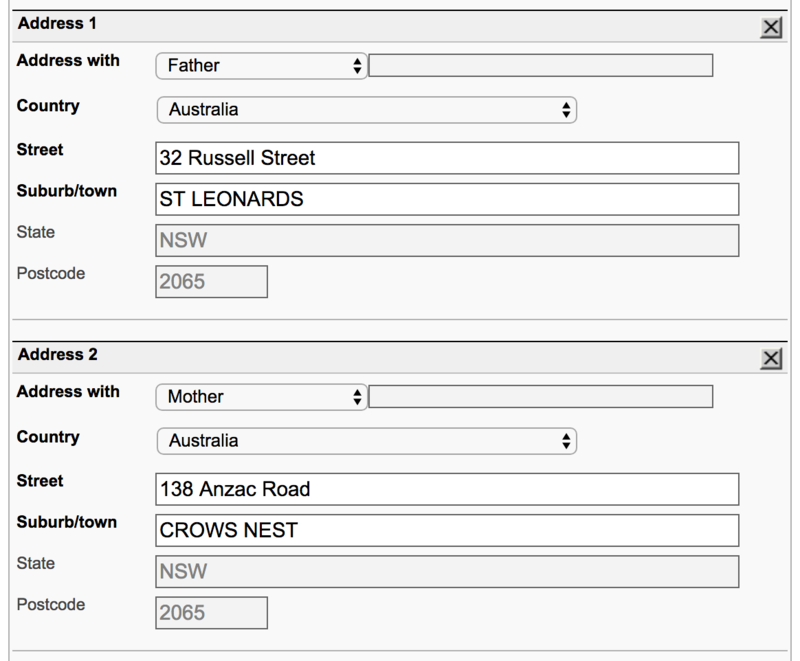 This will then reveal another set of address fields. If you have a parenting plan, this will come in handy for filling out the time, financial support, health and education information for each child. In ‘Time and communication with the child’ you’ll need to describe the amount and frequency of time the child spends with the parent who they don’t live with (or with both of you if they live with you both). In ‘Financial support’ you need to describe who pays for the costs of raising the child. Make sure you include any details of child support payments that may occur between you. For ‘Health’, describe what state of health the child is in and whether they have any diagnosis, treatment or ongoing medical needs. You’ll need to repeat this for all other children. And unfortunately you’ll need to retype addresses all over again. You’re now finished the information part of the application and should see green ticks against each of the sections. If one of the sections doesn’t have a tick against it, click it to bring it up and check that nothing is missing or filled in incorrectly. This is the point that you both need to check that you’re happy with the information that has been put into the application. You’ll be locking the application in the next step and won’t be able to change it after this. The easiest way to check the information is by using the print preview button, which will download a PDF document with everything you’ve put into the application. You can then print or email this for both you and your ex-partner to review. Now it’s time to provide any documents that are needed. What you’ll have to provide will depend on your answers in the application. At a minimum, you’ll need to provide your marriage certificate. Other things that you may need to provide are any existing parenting plans or orders and evidence that you were separated under one roof. 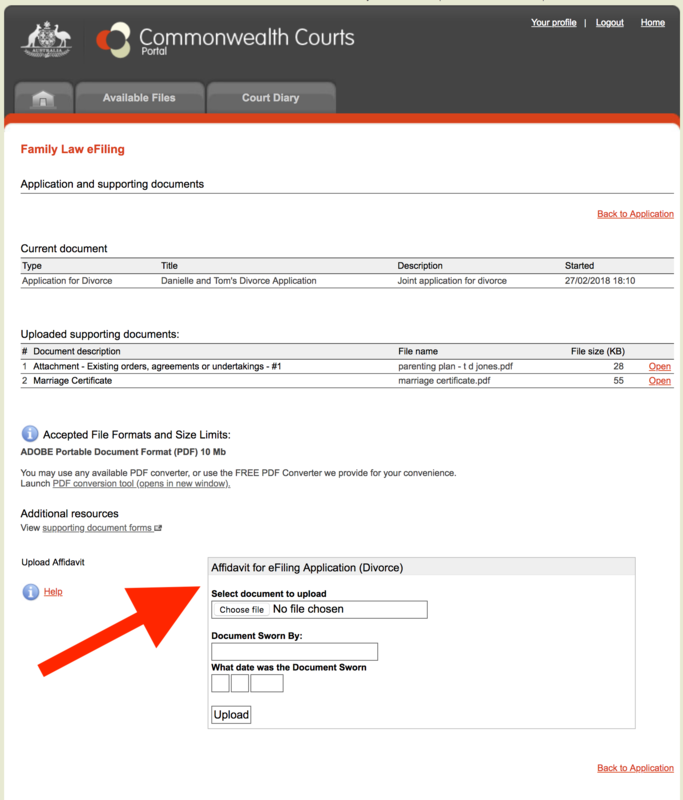 Everything you need to provide will be listed as links under the ‘Required documents’ heading. 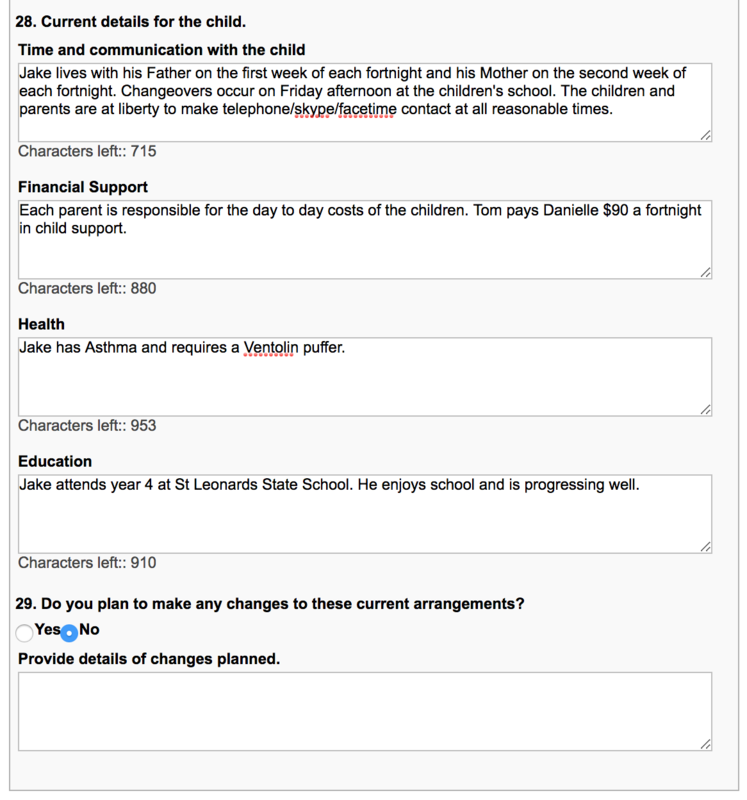 In this example I indicated that I had a parenting plan so this is the first document requested in the screenshot. To upload your document, click the document link under the ‘Required documents’ heading. You’ll need to have your documents ready in PDF format. They will also need to be under 10 Megabytes each in size. If you don’t have your documents in a PDF format, you can use the free PDF converter provided on the upload page that we’re about to go to. Clicking the document link will take you to another page where you’ll upload the document itself. Click the ‘Choose file’ button. This will open a window on your computer from which you can select the file. Once you’ve selected your file, you’ll see its name now appear in the box. You should now see a tick next to the document that you just uploaded. Repeat this process for all documents that are listed under the required documents heading. You’re now ready to finalise and submit your application. You should see a screen with ticks against all of the links in step 1 and step 2. You should have also confirmed all of the details with your ex-partner and both be ready to proceed. Click the ‘Lock and continue’ button. This will lock the application, which means you’ll no longer be able to make any changes to it. Pressing the lock button will then take you to a new screen with steps 4-7 shown. You’re now on the home stretch. This one is really straight forward. 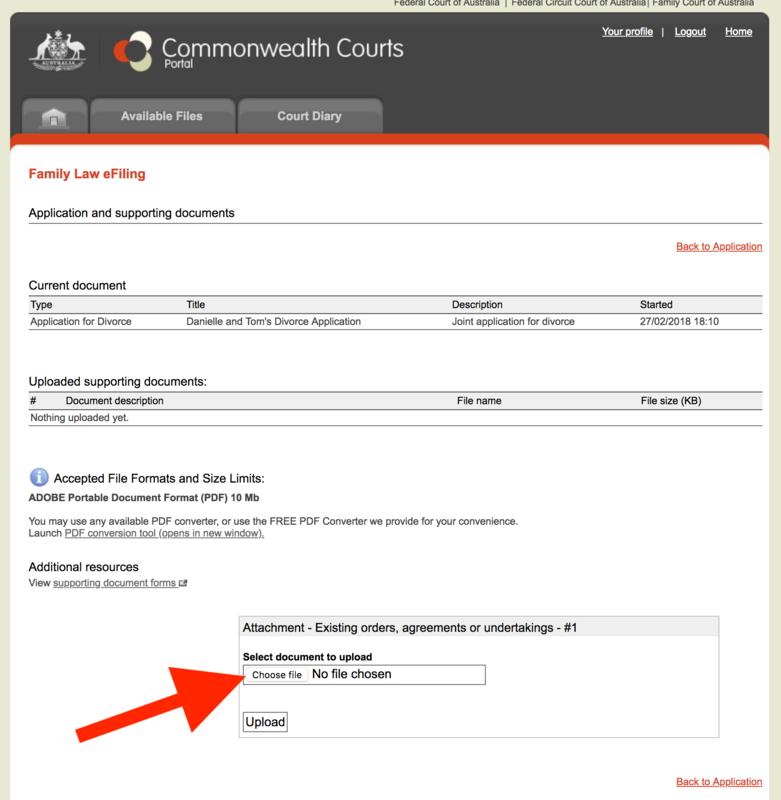 Pressing the ‘Print Application’ button will download a PDF of the divorce application document to your computer. You’ll now need to swear or affirm the document. This is simply how you attest to the truth of what is contained in it. Swearing is a religious form of attesting to the truth, affirming is the secular form. It makes no difference to the application which of these you choose. You’ll need to do this in the presence of a Justice of the Peace or lawyer, so don’t sign anything until you are with them. You and your ex-partner can do this together or at separate times with separate witnesses if you prefer. You will need to sign the same copy of the document however. The last 2 pages of the application are where you’ll find the section that needs to be completed and sworn or affirmed by a Justice of the Peace or lawyer. 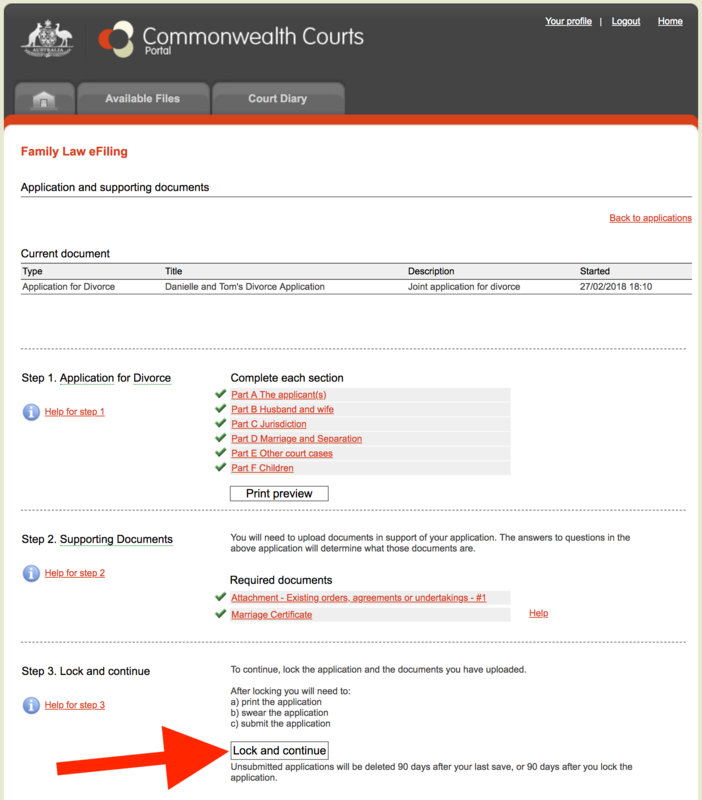 Once you’ve sworn or affirmed the Affidavit for eFiling Application (the last 2 pages of the application that you downloaded), you’ll need to scan and upload them. To do this, click the link ‘Affidavit for eFiling Application (Divorce)’. You’ll then see a page that shows all of the documents that you’ve uploaded so far. Again, there will be a link to the free PDF conversion tool if your document isn’t already in PDF form. 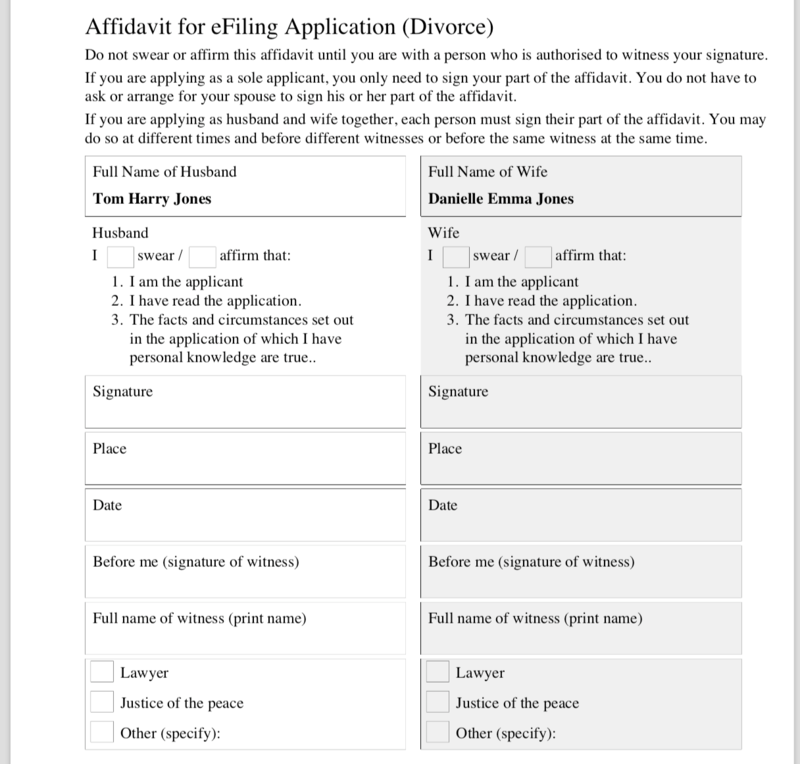 You’ll also see a box at the bottom of the page where you can upload the Affidavit that you’ve both signed. Fill in your names and the date that you signed it. Press the upload button. You should now see a tick next to the link. This will be the easiest step of them all. All you need to do here is download the brochure and tick the box saying that you’ve done so. You’ve now reached the final hurdle. First, choose the state in which you’d like to submit the application. For this, you can simply choose the state in which you live. If one of you now lives in a different state, choose the state that you both lived in when you separated. 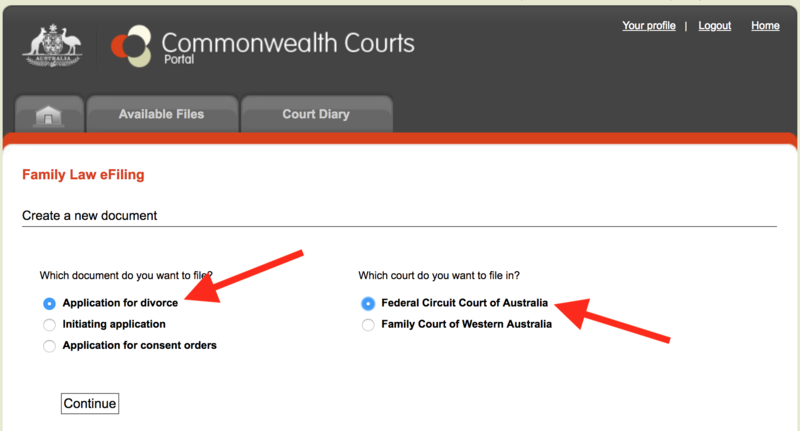 Now click the ‘Get locations’ button to reveal the specific court locations for the state that you selected. Just choose the location closest to you. Don’t worry, this is just a formality. 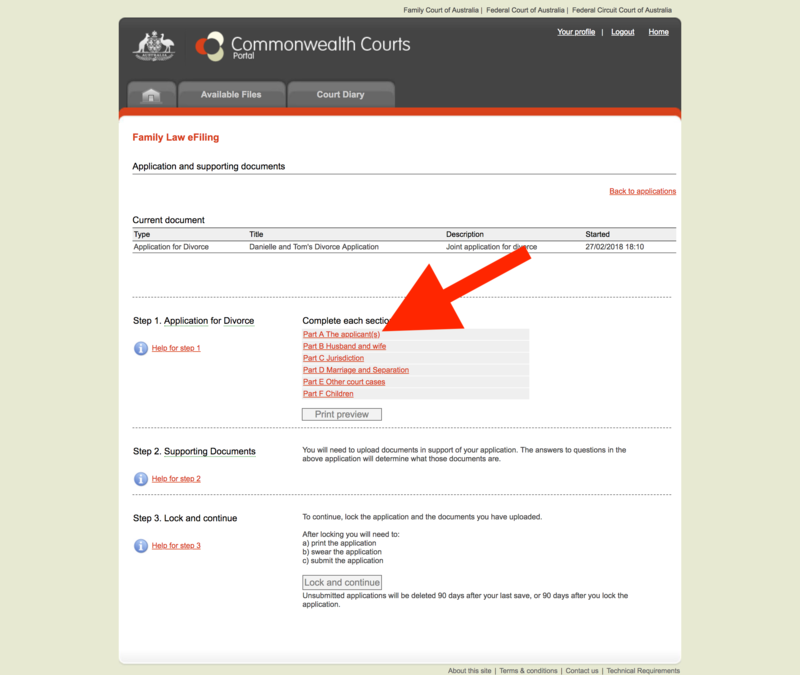 If you’re submitting a joint application, you don’t actually need to attend the court. Your only option for payment is credit card, so tick this box. You’ll need to provide your email address for the court to contact in relation to the application. You’ll also need to tick the box acknowledging that you can be contacted. The cost is $865 to apply for divorce, so you’ll need to agree between yourselves how you are going to cover the cost. As mentioned earlier, there is a reduced fee for those eligible for a concession, but to get this as a joint application, you’ll both need to qualify. You can read more about fees and fee reduction at the court’s website. Finally, click the big ‘Submit application’ button and you’ll be taken to the Commonwealth Bank’s website to finalise the payment. Well done on resolving things and I hope that this piece made it easier for you in some small way. You may also find our divorce 101 articles really help you with things like navigating the process, working out who gets what, legally finalised things properly, and co-parenting children. If you know someone is currently going through separation and divorce, the adieu process might be exactly what they need to resolve things quickly and amicably. Finally, if you found this helpful, please let us know as it takes effort to put articles like this together. Also drop us a note if you’ve spotted a mistake or think we could improve it in some way.